TESD Voters will select 4 school board directors on Tuesday — Who will get your vote? Commenters have started a dialogue on the last Community Matters post about the selection of TE school board directors. The discussion is important and I want it to continue. On Tuesday, the TE community will select 4 school board members from the 8 candidates in the race. ** Buraks and Brake are incumbents seeking re-election for another 4-year term. With the exception of Piccioni and Kim, the other candidates participated in the League of Women Voters forum. In case you missed it, click here. With the exception of Kim, the other candidates supplied Main Line Media News with a brief statement that contained their background, experience and why they thought they should be elected (or re-elected as in the case of Buraks and Brake). Click here for the MLMN article on the school board candidates. Beyond the LWV forum and statements in the newspaper, you can find further information online – some of the TE school board candidates have their own websites. A quick Google search found Tredyffrin residents Buraks, Connors, Dorsey and Brake with websites but I couldn’t find sites for Easttown candidates. Additional information can be found on the Democratic school board and supervisor candidates at Tredyffrin Township Democrats website, www.ttdems.com. Unfortunately, the local Republican Committee in Tredyffrin has not updated their website since before the May Primary, www.ttgop.org . And then we have all been bombarded with the endless stream of campaign literature in the mailbox. As a registered Independent, I have the good fortune (?!) of receiving candidate campaign flyers from the Democrats, Republicans and any ‘other’ political party affiliation! There has been much discussion on Community Matters about ‘knowing’ the candidates before you go on Election Day. As voters, what should we look for in a school board candidate? What important issues in TESD are important to you, the voter … teacher contract negotiations, special education, outsourcing, pension reform, transparency, quality of education, employee morale, respect for diverse points of view, property taxes, etc.? Which candidate supports your position? At the baseline, we know that all the school board candidates believe in the value of public education. But who do we select that will govern with the interests of the entire school community – the children, the parents, the taxpayers. Whose background and experience makes him or her most qualified for your vote? I welcome your comments on the 8 TE school board candidates but will not post any comments that contain personal attacks or mention of candidates spouses and/or children. Please keep the focus of your comments on the individual candidates and the important District issues. Election Day 2013 is 4 weeks from tomorrow, Tuesday, November 5. If you are not registered, today is the last day to register to vote in the Municipal Election. Applications from Pennsylvanians registering for the first time, those changing their address or changing their party affiliation must be postmarked or delivered to Chester County’s board of elections by the close of business today, October 7. Chester County’s board of elections is located at Government Services Center, 601 Westtown Rd., Suite 150, West Chester, PA 19380. Their phone number: 610-344-6410. Office hours: 8:30 AM – 4:30 PM. Do you know the candidates for the Board of Supervisor or the Tredyffrin Easttown School Board? What issues facing the township and school district are important to you – do the candidates share your concerns, your opinions? How likely are you to vote on November 5? If you are a voter in Tredyffrin Township, you will have an opportunity to learn more about the Board of Supervisors candidates. The League of Women Voters is holding a supervisor debate on Saturday, October 19, 2-4 PM at the Tredyffrin Township Building. There are three contested seats on the Board – two for supervisor-at-large and a district supervisor for the middle district. Seeking one of the two at-large supervisor seats is incumbent Michelle Kichline (R), Trip Lukens (R), Murph Wysocki (D) and Mark Freed (D). Current at-large supervisor E.J. Richter (R) is opposing Laurie Elliott (D) for the middle district seat. In recent years, the League of Women Voters also has held a debate for the TE School Board candidates. Unfortunately, the volunteer organization will not hold a similar debate this year for the school board candidates. This is an important time to know your candidates – what are their backgrounds and experience, where do they stand on issues, etc. etc. So … why no debate for the school board candidates? Do you know who the school board candidates are? On the Tredyffrin side of the school district, we have Democrat incumbent Kevin Buraks being challenged by Republican Pete Connors in Region I. In Region II, Scott Dorsey (D) opposes incumbent Rich Brake (R). On the Easttown side of the school district, there are two seats available in Region III. For personal reasons, neither Betsy Fadem (R) nor Anne Crowley (D) is seeking re-election. I attend almost every school board meeting and I have not met any of the four candidates vying for the two open Region III seats. The candidates are Republicans Doug Carlson and Virginia Lastner and Democrats Maryann Piccioni and Jean Kim. School board candidates Pete Connors and Scott Dorsey have each stated that they want the opportunity to discuss school district issues and are interested in pursuing a debate forum with the other school board candidates — Neither knows why a debate was not scheduled as in prior years. Because of my discussion with Connors and Dorsey (and the interest from the public in learning about the school board candidates), several options are being explored. However, with only 4 weeks remaining until Election Day 2013, it does not leave much time to organize a ‘meet your school board candidate’ forum. If the past is any indication, the political war for control will rear its ugly head over the next 30 days with school board and supervisor candidates door knocking, campaign mail pieces hitting our houses and the robo-calls that invariably come at dinnertime. Voters need a reason to go the polls on November 5 – they need to know the issues and which candidates support their views. Everyone should be interested in the election because the future of the township, the school district and the community are dependent upon strong, issue-focused leadership. The issues are complex and the School Board (and the Board of Supervisors) must work as a team united (with the community) to find effective solutions. Outcome of TE School Board Meeting more suited for black roses than white ribbons! Much like the last TE School Board meeting on May 13, the audience was filled with residents and staff, including aides, paraeducators, paraprofessionals, teachers and TENIG members … the outcome of the evening more suited for black roses than white ribbons! The same 9-0 Board vote to cut the weekly hours of aides and paras to part-time, 27.5 hours could have taken place in the first 5 minutes of the meeting, rather than dragging the vote out until 10:30 PM. To those of us who attended, we all now know that the minds of the school board members were made up before the meeting ever started. During the first public comment period of the night, TESD resident Neal Colligan delivered a statement that included the timeline of activity surrounding the decision on the District’s aides, paraeducators and paraprofessionals. The ever-changing status of this group of District employees began six weeks ago with the outsourcing of their jobs to STS. When STS pulled its proposal, the District turned to another outsourcing company CCRES. Its unclear what happened with the CCRES outsourcing plan – that plan disappeared without explanation. In its place, the employees were notified about 10 days ago, that their hours would be cut to part-time. Colligan stated, “No one has seen a vote on any of these decisions. The community, the employees who live in our community and the members of the public who have taken an interest in this issue ask for that vote tonight.” He asked that the Board listen to the residents before taking the vote. Often we hear residents complain about a local issue but when you suggest they speak up at a public hearing the answer most likely is this: “Why bother, no one listens.” Nothing truer could have been said about last night’s school board meeting! After a series of meetings, phone conversations and emails with many of the District aides and paras, it was clear they feared retribution if they spoke publically. Believing that the Board needed to hear their testimonials, I collected personal statements to read. With the 5 min. limit imposed for individual resident comments, I was only able to get through two letters. I appealed for audience volunteers and residents lined up to read aloud the letters into the meeting testimony. The thoughtfully written personal statements are with an insight that only comes with years of experience in the school district. Although personally affected by the decision to reduce their hours to part-time, the overriding concern of aides and paraprofessionals in their statements, is for the education, safety and well-being of our District’s children. – There is no substitute, when working with all children and especially kids with needs, for consistency, continuity, trust and relationship. – The aides and paras have been treated as puppets and the Administration and School Board are the Puppet Masters. – The loss of hours, I fear, will cause unnecessary turnover of staff with detrimental effects on school programs and the students of the district. – We go the extra mile because many of us had our own children go through TE and we are proud of the TE tradition. You cannot pay for that. Many of the aides were originally volunteers at their schools, putting in many hours making TE schools what they are. – What does affect me is seeing our school district begin a race to the bottom under the care of this school board. The beginning of the “Walmart-ization” of our district as one speaker called it at a recent meeting. – There is a saying in organizational psychology, “If you want to know what is important to leaders don’t listen to what they say, watch what they do.” What do you think your end run around the ACA says about how important the aides are to this school board? – The school board doesn’t care about us and they never will. – The relationship and bond between the aides and the children will be shattered with a revolving door of strangers in their lives. Beyond the nightmare of scheduling problems with all the part-time workers, are you prepared for the security risks that will come with brining all these new people into the schools? – If something bad happens as a result of your actions towards the aides and paraprofessionals of TE, it’s going to be your fault and no one else’s – you will have to live with the consequences. In addition to the anonymous testimonials read for the record, several brave employees delivered their own written statements to the School Board, which contained similar sentiments. Audience members who volunteered to read the personal statements, added their own messages of support for the aides, and encouragement to the Board to do the right thing. On behalf of the TESD teachers, Laura Whittaker, president of the teachers union, delivered an impassioned plea to save the hours of the aides and paras, describing their important contribution to the District’s children and their families. Following-up on her comments presented at last week’s Finance Committee meeting, TESD resident Joanne Sonn, sought and received guidance from the National Women’s Law Center, a Washington DC advocacy group with expertise in healthcare law. Sonn presented a letter (click here to read) to the Board from Dania Palanker, Senior Counsel at the Women’s Law Center. The letter puts forth the assertion that under current laws a self‐insured plan (to which TESD switched in 2011) can be in compliance with nondiscriminatory testing regulations while still offering a separate group of 30‐40 hr. /week workers a lesser valued plan. As a result of Palanker’s information, Sonn respectfully requested the Board to reconsider its plans to avoid Affordable Care Act compliance by reducing the hours of District employees to part-time status. The legal opinion of Palanker was dismissed by the District’s solicitor Ken Roos and the benefit expert from his firm, attorney Rhonda Grubbs. They remained constant in their advice to the Board … claiming that the only way to avoid the ‘possible’ penalties of the ACA was to reduce employee hours to under 30 hours per week. It was stated and re-stated by some Board members that the District could not afford the cost of healthcare for the lowest paid District employees nor could we afford the cost of possible associated penalties for ACA non-compliance. So … in the end, the Board took a vote (9-0) to decrease the hours of aides, paraeducators and paraprofessionals to 27.5 hours a week. The vote also represented a decision not to listen to the residents, parents, aides and paras, teachers or the senior counsel of the National Women’s Law Center. Instead, all school board members chose to follow the opinion of the District solicitor. Sadly, the takeaway from the Board’s action is that if you live in this community and feel that, you are not being listened to or acknowledged, you are probably right. The Board’s claims that the District cannot afford healthcare for the lowest paid and/or the possible financial risks for ACA noncompliance may work for some residents. However, these claims of fiscal responsibility ring false when we learn that the District, for another year in a row, has uncovered a multi-million budget surplus. Or that the Board can afford to give bonuses to administrators and raises to the District solicitor and his attorneys … or that the Board can stand behind a 10-year $50 million ‘dream’ facilities plan to be paid for by taxpayers for years to come. Beyond our yearly tax increases, we have a school board who chooses to go after revenue from nonprofit organizations and seeks to charge taxpayers for the use of tennis courts. The most troubling aspect of the school board meeting was the Board’s total disregard for the residents and their message. Our ‘collective’ votes elected these people to listen to us; but based on last night, it was obvious that what the community wants is not part of the Board’s agenda. Residents need to learn to vote for representatives that will listen and serve us instead of only pandering to us during election time. To review … Of the nine currently serving school board members, Anne Crowley and Betsy Fadem, are not seeking re-election, their terms end December 31, 2013. Kevin Buraks and Rich Brake are seeking re-election and their names will appear on the November ballot. Buraks and Brake’s opponents, Pete Connors and Scott Dorsey, respectfully, support the District staff and spoke out last night against the Board’s decision to cut the hours of aides and paraeducators. In addition, Connors questioned the proposed budget expenditures and surplus and to his credit, Dorsey asked for (and received) an apology from school board member Pete Motel for his behavior toward resident Joanne Sonn at the Finance Committee meeting. Note: With the 10:30 PM vote to decrease the aides and paras to 27.5 hours, over half of the audience got up and walked out, including myself. For those that remained, it is my understanding that Rich Brake delivered a lengthy personal statement and presumably the 2013-14 budget was passed. This was the first time I have ever left a public meeting before it ended but somehow there seemed little reason to stay. For those that did stay, please fill us in on what we missed. As a follow-up to my last post on Tredyffrin Township supervisor candidates and TESD School Board candidates, I have updated information on the two Easttown, Region III positions on the T/E School Board. The two current Region III Board members Betsy Fadem (R) and Anne Crowley (D) are not seeking re-election. Exceeded in longevity only by Pete Motel, who is in his fourth term on the School Board, Ms. Fadem has decided that three terms on the Board is her limit. Ms. Fadem was elected to the Board in 2001 and 2013 marks her twelfth year in office — she will finish her third term this December. Currently Ms. Fadem chairs the Finance Committee and serves on the Facilities and Policy Committees. I have decided not to seek re-election for a fourth term as a T/E School Director and will complete twelve years on the Board in December 2013. I believe it is time for a new generation of members to serve. I am proud of the work and accomplishments of the Board and the District during my tenure and I look forward to other opportunities to serve the community. The other currently serving Easttown, Region III Board member, Anne Crowley, has also decided not to seek re-election. Ms. Crowley was elected to the Board in 2009 and currently serves on the Policy and Legislative Committees. Behind Ms. Crowley’s decision not to seek a second term on the Board, is the idea of giving others in the community an opportunity to serve. Since the first of the year, there have been two particularly important votes taken by the Board – the vote to hire former police chief Andy Chambers as the District security expert and the vote to approve a consent agenda that included administrator raises (therefore not allowing for public discussion). In both of these important votes, Ms. Crowley cast a dissenting vote. Lack of Board transparency was her stated reason in both of these votes. Transparency in our government’s actions is very important; thank you Anne for also making it a priority. I would be remiss if I did not also say that Rich Brake, like Ms. Crowley, cast dissenting votes on these two issues, stating lack of transparency as his reason. There are four Easttown, Region III candidates for the School Board. Doug Carlson, Virginia Lastner and Maryann Piccioni are cross filed, Republican and Democrat and Jean Kim has filed as a Democrat only. The Tredyffrin, Region I candidates for the School Board, incumbent Kevin Buraks (D) and Peter Connors (R) are cross-filed, Republican and Democrat and Tredyffrin, Region II candidates for the Board, incumbent Rich Brake (R) and Scott Dorsey (D) are also cross-filed Republican and Democrat. I watched Segment 2 of the series, and with no disrespect intended, it took me 3 failed attempts before I could get past the first 10 min. of the 29-min. show. Although both Brake and Gallagher are identified as ‘Constitution Scholars’, from my vantage point it seemed that Gallagher’s role was that of an interviewer asking questions, with responses left to Brake. Not that there is anything wrong with that approach, I just think it is a bit of a misnomer that they refer to themselves as co-hosts. In my opinion, this segment was a bit disjointed in the delivery of information with some technical, editing and sound issues, making it difficult to follow at times. When discussing the ratification of the Constitution, many nuances exist between the Federalists and the Anti-Federalist point of views and they should be thoroughly considered — each group waged a verbal war in hopes of winning public support for their side. The supporters of the Constitution, the Federalists, argued that the nation needed a stronger national government to create order and stability whereas the anti-Federalists supported the states’ rights approach to government. Arguing that the Constitution gave too much power to the national government at the expense of the state governments, the Bill of Rights became a weapon of defense and the most effective tool for the anti-Federalists. They demanded a more balanced Constitution, one that would be careful to protect the rights of the people and to set limitations on the power of the government. The American people had just fought a war to defend their rights and they did not want an intimidating national government taking those rights away again. Although the anti-Federalists lost the ratification battle, the Bill of Rights stands as a lasting testament to the importance of individual rights. I found Brake’s discussion of citizen representation interesting. He compares the increased size of voting districts today versus the size they were at the time of the ratification of the Constitution and ponders the question, “Can representation actually take place well, in a setting that is large and distant from the public?” Due to the size of voting districts, Brake talks about the increased resources and finances required by politicians seeking office today. Due to the financial demands of political campaigns, Brake laments that is likely that only the financially elite can afford to seek office. As a result, there is a risk that elected ‘elite’ may not necessarily represent those that they seek to serve. As a proponent of campaign finance reform, I agree with Brake on this point. 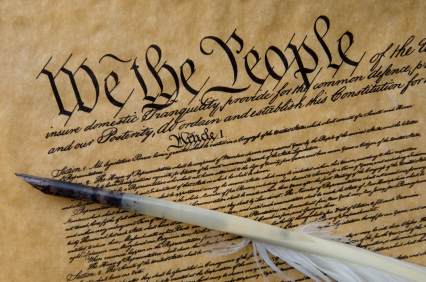 In the discussion of the original 10 amendments contained in the Bill of Rights, Brake identifies several, including freedom of speech, religion, petition, right to bear arms, freedom from search and seizure, right to counsel, etc. He points specifically to the importance of the 10th amendment — “The powers not delegated to the United States by the Constitution, nor prohibited by it to the States, are reserved to the States respectively, or to the people.” Based on Brake’s emphasis on the rights of the States under the Constitution, I was surprised that he did not use the opportunity to discuss the 10th amendment as related to the Supreme Court decision on the health care bill. There are some, including Mitt Romney who believe that the 10th Amendment places the responsibility and care of health care to the people with the individual states. I lay no claim as a ‘Constitution Scholar’ and offer these remarks on Constitutional Conversations solely as my opinion. I suggest taking 29 minutes, watch Segment 2: Battle for Ratification, and offer your own thoughts. Click here to watch the second installment of Constitutional Conversations. What do you get when you mix a Republican T/E School Board member with a recently elected Tredyffrin Township Republican committee person? The answer, as I discovered on Saturday, is a new township cable show, ‘Constitutional Conversations’ co-hosted by T/E School Board member Dr. Rich Brake and M-4 Tredyffrin Township Republican Committee man Dennis Gallagher. “ … Constitutional Conversations was conceived at the grassroots level in Tredyffrin Township in Chester County, PA. In the latter part of 2011 Dr. Richard Brake, a resident of Tredyffrin and co-host of Constitutional Conversations, gave a lecture on the Constitution which was attended by some Tredyffrin community leaders. After the lecture the township leaders approached Dr. Brake requesting him to produce a series on the Constitution for the township’s public access television station. They felt that such a series would be an excellent educational opportunity for the township residents and also a wise use of the township’s public access television facilities. Most of us know Rich Brake as a member of the T/E School Board. In addition to his elected position, Brake serves as the National Director of Education at the Intercollegiate Studies Institute in Wilmington, DE. According to their website, “ISI seeks to enhance the rising generation’s knowledge of our nation’s founding principles — limited government, individual liberty, personal responsibility, the rule of law, market economy, and moral norms.” Brake is listed online as a member of two local Tea Party groups, Chester County Patriots and Valley Forge Patriots. Brake and I have been playing ‘email tag’ over the last month, trying to schedule a meeting to discuss a Constitution class he was giving for local TTGOP committee people and his involvement in the Tea Party movement (The June Constitution class was ultimately cancelled). It appears that Gallagher and Brake may have been blood brothers in a former life … apparently sharing similar views on traditional conservatism, limited government and Founding Father principles, they have come together for ‘Constitutional Conversations’ to discuss and educate the public on the Constitution. Looking ahead to upcoming topics to be discussed on the cable show, they have scheduled Part 5: Health Care and the Constitution for August 20. In last week’s landmark ruling, the Supreme Court announced that in a 5-4 decision (with Justice Kennedy dissenting and Chief Justice Roberts writing the decision) that Obamacare, for the most part is constitutional. It could be interesting to hear the discussion of the health care decision by the Supreme Court discussed by Brake and Gallagher in the final segment of Constitutional Conversations. Update: For the first time since I began Community Matters nearly 3 years ago, I substantially edited an article after it was posted. Originally when I posted this article on ‘Constitutional Conversations’, I included comments from local attorney John Petersen. Within a span of less than 24 hours, I received some negative comments and emails about my post and Petersen’s remarks. As a result, I made the decision to edit the post and remove his comments. I need to be clear … Mr. Petersen did not volunteer to give his remarks on this post, I asked for his comments on Constitutional Conversations and then posted those comments. However today, I made the decision to remove his remarks along with the associated comments. Regrettably, I did not notify Mr. Petersen until after I removed his remarks. As a result of my actions and decision to remove his comments and associated comments, Mr. Petersen wants to set the record straight on this matter and I am honoring that request. Below are Mr. Petersen’s new updated remarks on this blog post. I’d like to respond to the comments re: the objections over my solicited comments re: Messer’s Brake and Gallagher and their foray into the world constitutional analysis. Accordingly, I’m happy to provide the substance of my point here. If you are going to be considered a “Scholar” – then the body of your work, your statements, etc needs to be looked at in its entirely. You cannot simply cherry pick the things you want. So…if we are going to evaluate, then let’s evaluate the whole cloth. If you view the cable show on its own, in a vacuum, then you lack the necessary context of what these guys are about. They are quite clever – starting with the seemingly innocuous historical facts. But look how it ends – with health care? It’s not like they leave these extreme political positions at the door. They have a right to say what they want. Folks have a right to be fully informed about what these guys stand for and that their real agenda is advancing their own political view points. It’s kind of ironic when much of what they say is about how the “Left” has captured the media, academia, etc. It’s actually more hypocritical than ironic. That was MY point – that these guys are not really acting in the role of “Constitutional Scholar”. Rather, they are acting as covert politicos that are using the constitutional topic as a pre-text. One may say “Gee John, that’s just YOUR opinion.” To that, I’d say “Yes, it’s my opinion, but it is an informed opinion.” I’d also say to those same people “You are entitled to your own opinion, not your own facts.” My only exception to this are places like school board meetings where recently, Brake has decided to use that platform as part of his “Constitutional Scholar” outlet. I think that is way out-of-bounds. With that, let’s confront the question of whether these two guys are “Constitutional Scholars.” This matter needs to be settled before it is determined whether getting into the sum and substance of these shows is warranted. If one can argue that these two are not constitutional scholars in spite of the fact that they call themselves that, we can settle the matter right there. That would seem to me to be a reasonable approach. As to whether they are “Constitutional Scholars” – I’d have to ask them for their credentials. I get the fact that Brake has a PhD – in American Politics. I get that he knows a lot of historical facts. But what I also get is that much of what he says is laced with a very specific political agenda. For backup on that assertion, I cite the YouTube links listed above. As for Gallagher, sorry to have to be the voice of reason here, but part way through an online school for an MA in History with a concentration in American History simply does not rate one the title of “Constitutional Scholar.” That, coupled with his tweets, blog posts, etc – give evidence to what is also a very definite political viewpoint that are clearly, deep rooted beliefs. Note, I’m not judging Gallagher’s and Brake’s political view points. I’m indifferent as their viewpoints don’t affect me one bit. I don’t agree with them, but that is not the point. They have every right to express their view points. That said, one of them is an elected official and one of them is an elected committeeman. They have direct involvement in the political process which makes them public/semi-public personalities. When you place your views in the market place of ideas, you invite scrutiny. Whether you are able to withstand/tolerate that scrutiny is another matter. And with that, since they are not Constitutional Scholars, I really don’t need to get into the sum and substance of what they are talking about. But if called upon to do so, I’m more than happy to engage. Devon Petitions: Where do we go from here? I attended the Devon Petitions town hall meeting last night. Organized by Sean Moir and Rich Brake, 34 residents attended, including elected officials — State Rep Warren Kampf, township supervisor Mike Heaberg and school board director Anne Crowley (in addition to school board director Rich Brake). The basis for the Devon Petitions: Community Solutions for a Better Tredyffrin was a four question on-line survey. Moir and Brake offered that they received 114 responses to their survey. The four questions were broad in their scope. On the township side, the questions asked responders (1) to list recommendations for stimulating economic growth and (2) what did they consider the greatest challenges for long-term economic growth in the township. On the school district side, the survey asked responders to (1) list recommendations for improving student achievement and (2) the greatest challenge to improving educational quality in T/E. Moir presented the responses to the township side of the survey and Brake presented the responses for the school district questions. For the township side of the survey, Moir presented the list of responses to the two questions. As reported by Moir and Brake, the majority of those that responded to the survey, considered the Paoli town center and transportation center as most important for stimulating growth in the township. The discussion from the audience quickly turned to the empty storefronts, not just in Paoli but also throughout the township. The general feeling from those in attendance was there needs to be greater support for the community’s small business owners and the suggestion to reducing the ‘red tape’ of regulations and permit issues. Two of the six members of the township’s Business Development Advisory Council, Stanford Nishikawa and Eric Kleppe attended the meeting and explained their mission was to develop strategies for economic stimulus in the township and to present their recommendations to the Board of Supervisors. It was apparent to me last night, that many residents share my concern and desire to support small businesses in the township. As a small business owner in the township, I find it very troubling that there are no small business owners sitting on the advisory board. Although Nishikawa and Kleppe discussed meeting with Judy Huey and her brother Rob (owners of Paoli Village Shoppes), I was unclear on any further outreach plans by the advisory group to small business owners. Kleppe explained that the group started meeting in December and the project is to take 4-6 months before the public hears their recommendations. Keeping money local and in the community by supporting local small businesses is important and Nishikawa and Kleppe were encouraged to receive genuine input from the small business owners. Here’s hoping that they heard the message and take it back to the other members. There were suggestions that the economic advisory group should look at successful business areas within the township (Gateway Shopping Center) and communities outside the township (Media,Wayne, Phoenixville,West Chester) that have successful business models and see if it can be duplicated in downtown Paoli. The survey results indicated the national economy as the greatest challenge for achieving long-term economic growth in Tredyffrin. Because of the economic situation, another challenge then becomes how does the community maintain their property values? Although not intended as a political project by Moir and Brake, it was interesting to note that respondents to the Devon Petition, suggested lack of vision in the community and politics as challenges for long-term economic growth in the township. For the school district side of the survey, Brake provided a list of the responses to the two questions. Funding the state pension and the current teacher contract negotiations were discussed as the most important school district issues. Although there is high regard for the T/E schoolteachers, it was the consensus that the next teachers contract needs to include a more reasonable benefit plan, particularly health care. I have attended many school board meetings and subcommittee meetings and I don’t know of any public/private partnership discussions. The idea of partnering with local corporations and providing volunteer teaching opportunities was innovative and could be explored ‘out-of-the-box’ thinking to help with the escalating school district cost. The results of our survey confirm that our community is fully aware of the budgetary challenges that the school district faces, as the pension crisis and a more sustainable salary and benefits package for our fine teachers were the most mentioned responses to our two education questions. These twin budgetary concerns were tied, not surprisingly, to the public’s desire to maintain our high educational standards and results. Clearly, the community is ready for problem solving in those two areas, and are eager to continue the process of educating the public in order to build community consensus and forward momentum. I walked away encouraged that we have a very smart and realistic community, and they are ready to exercise leadership in these areas. I’ll add that I was happy with the turnout, which was 34 people including the presenters. It was nice to see a mix of state and local officials, various board and commission members, as well as residents who are not the “usual suspects” at board meetings. Once we get our notes together, I’m hoping that the Tredyffrin Business Development Advisory Council will follow through with some of the citizen suggestions, which included meeting directly with commercial property managers, developers, and small business owners to discuss what it might take to stimulate local business development. That was something that we seemed to have consensus on that cut across party lines – just the kind of common ground we were hoping for. So, where does this grass roots effort really go from here? Last night’s audience members were engaged and respectful but as contained in the meetings introduction,Tredyffrin Township has a population of 29,000 people living in 11,000 households. Yet only 114 people responded to the Devon Petition survey and only 34 people showed up for the meeting. Yes, it was a holiday weekend and people were away but . . . ?